The I'm not a plastic bag bag. It was three hours before the Anya Hindmarch store in New York City's Soho was open for business on Wednesday, and already 20 fashionistas were excitedly waiting in line. "I can't wait" said Grace, 24, who didn't want to give her last name because she had called in sick to work to be there. By the time the shop opened at 11 a.m. the line was snaking down a city block with well dressed young women huddled under Chanel umbrellas waiting for their chance to buy the "it" bag of the season. Within three hours that bag, being offered for the first time across the U.S., had sold out of every Anya Hindmarch boutique in the U.S.
That kind of crazed demand for a hot accessory is nothing new, but this particular must-have accessory certainly is. The most coveted bag of the year is not a Birkin or even one of Hindmarch's own luxurious metallic bags, but a humble $15 canvas tote meant to lug groceries and embroidered with the phrase "I Am Not a Plastic Bag." And not surprisingly, the bag's sudden success and good intentions have generated a fair amount of backlash. The bag owes its existence to the U.K. activist organization We Are What We Do, which tries to inspire people to use their everyday actions to change the world and two years ago approached British bag guru Hindmarch to begin work on an accessible, affordable and environmental bag that would encourage people to reduce their use of plastic bags. A noble goal indeed, but one typically more contemplated than actually carried out by most shoppers. That all changed, however, when the bag was first introduced in Great Britain in April Keira Knightley, Alicia Silverstone and singer Lily Allen were photographed carrying it, fashion magazines jumped on the trend, it was part of the Oscar swag, and before the bags hit the country's Sainsbury grocery shops, supposed to be its primary retailer, a fanatic fashion following had taken root. The bags sold out immediately, with many turning up on eBay for hundreds of dollars. When 20,000 were released at 450 supermarkets across England, women got in line at 2 a.m. and had snapped up all of them by 9 a.m. Soon enough, the controversy erupted. First, similar looking bags began showing up with the phrases "Actually, I Am a Plastic Bag," "I Am Not An Anya Hindmarch Bag" and from marissav.com a tote that proudly declared, "I Am Not A Smug EXPLETIVE". Then The Evening Standard revealed that the so-called green carriers were made in China, using cheap labor, and that the bag was neither organic nor fair trade. Hindmarch responded that the message of We Are What We Do is that by changing the small things you do in everyday life you can make a large difference. Her company, she said, worked with a reputable supplier in China whose workers are paid double the minimum wage and that complies with Chinese Labor Law. And the bags were shipped by sea, and carbon credits were purchased to offset the environmental impact of production and transport. She's not the only entrepeneur trying to change the world one purse at a time. Working with the U.N. World Food Program (WFP), Presidential niece and model Lauren Bush has designed the FEED Bag  a stylish but sturdy tote bag made of brown sacking and white canvas. The proceeds from the $60 bag go to the WFP, which provided a staggering 16 million children worldwide with school meals in 2006 as part of their efforts to feed the 300 million children around the world that suffer chronic hunger. And Intuition (www.shopintuiton.com) has launched the Market Bag to help educate children in need. For each $85-$100 bag sold, Intuition will donate $35 to the International Rescue Committee. The goal is to raise $175,000 for the IRC's education programs around the world. 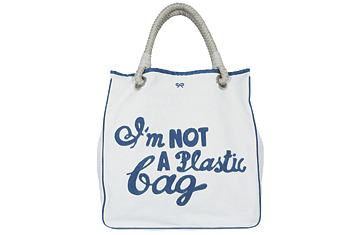 But none of these do-good totes have approached the success of "I Am Not A Plastic Bag." If you weren't in line Wednesday morning, you still have a shot. On July 18 a new edition of the bag is launching at Whole Foods Markets on the East Coast.